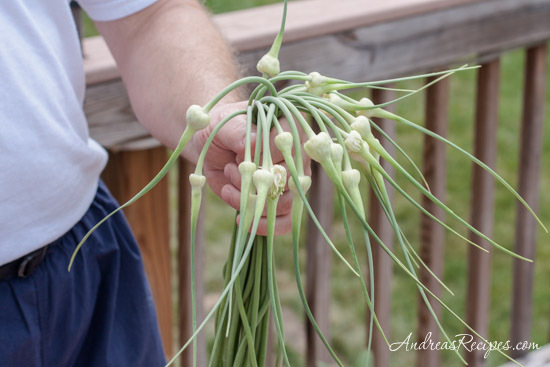 The garlic only has a few more weeks in the ground, then it will be time to dig it up, and if the flavor of the scapes is any indication, we are in for some spicy garlic this year. 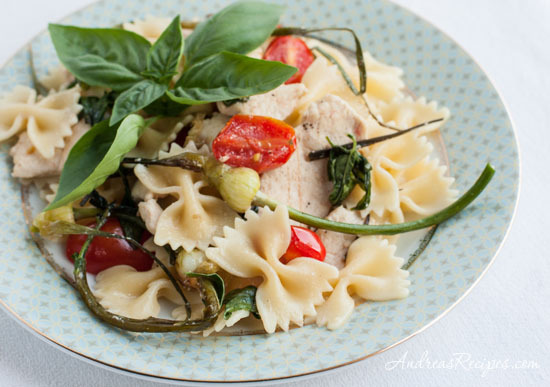 We harvested the scapes over the weekend and made three different things with them: pesto, cannellini bean dip, this pasta with chicken, tomatoes, and basil. We saved the pretty flowers and curved parts for the pasta and use the stems for the pesto and bean dip. The raw flavor of the scapes was pretty intense with a lot of bite, but once sautéed the flavor softened became more like a buttery roasted garlic. Because the raw flavor was so strong we thought the boys might not eat them in the pasta, but Builder Guy actually enjoyed them, though Top Gun and Monkey Boy regarded them with deep suspicion. For extra flavor we added some of our homegrown basil, which is doing very well this year. The tomatoes aren’t quite ready yet, but in a few weeks we should have plenty of warm summer tomatoes fresh from the vine. We hope you will join us for Grow Your Own, a blogging event that celebrates the foods we grow, raise, hunt, or forage. If you are new to the event, you can read more about the rules for participating at the Grow Your Own page, and you can send post information to me at andreasrecipesgyo AT gmail DOT com. The deadline for this month’s event is June 30th. 1. Bring water to boil in the pot, then cook the pasta until ad dente, about 10 minutes. Drain. 2. While the water boils, heat the olive oil in the pan and add the chicken, cooking until it’s almost cooked through, about 5 minutes. Season with salt and pepper. 3. Add the scapes and cook until the start to brown, about 3 to 4 minutes. Add the tomato halves and sauté until they brighten and just begin to release their juices, about 1 minute. Add the white wine and the basil leaves, cooking until the basil begins to wilt. 4. Toss the cooked pasta with the chicken and scapes until it’s all thoroughly mixed. Divide among plates and served garnished with grated Parmesan cheese. What a lovely pasta dish. This is something I enjoy having in the frig at all times. what an inventive way of using garlic scapes…I found some three weeks ago at the farmers market but I did not know what to do with them..